Unfortunately, the dress you are looking for (Style: DQ-9539, Name: DQ-9539) is no longer available. This long prom dress is feminine and ready for a glamorous night at your formal event. The fitted sleeveless bodice on this affordable prom dress has figure-flattering ruching and illusion straps that drape over the shoulders to the sheer back. The long v-neck dress has sparkling jewels that adorn the wide ruched band at the empire waistline. A full and fabulous floor-length chiffon skirt collects at the empire waist and flows softly down to the expansive hemline. 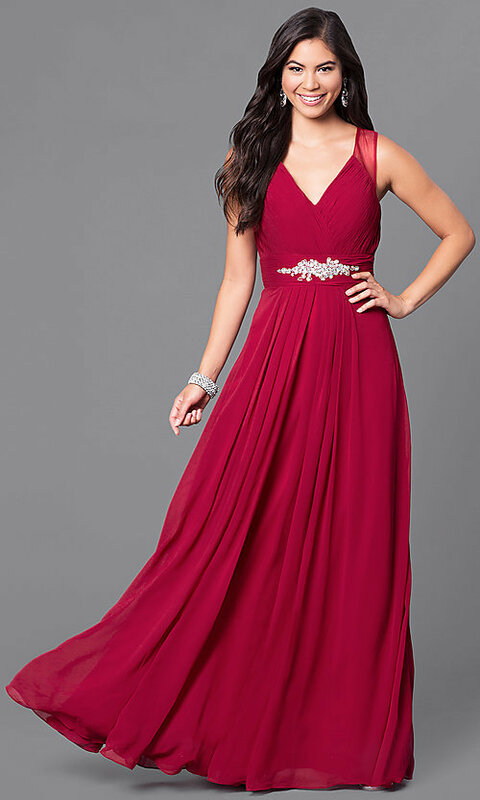 Priced right for your formal event, bridesmaids will love this beautiful long prom dress that is available in a wide array of colors in misses as well as plus sizes.